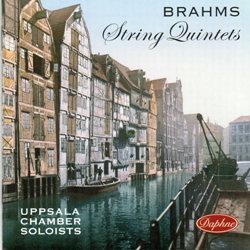 I have always felt that Brahms’ String Quintets have been the poor relations in the company of the rest of his chamber works. They certainly seem to be programmed and recorded less. Why this is so eludes me as they are both very fine works. Furthermore, the G major Quintet, Op. 111 I consider one of his greatest works. Composed eight years apart they follow the Mozartian rather than the Schubertian model, employing two violas rather than cellos. In this way, there was greater scope to endow the first viola part with more solo writing. He greatly admired the chamber music of Haydn, Mozart, Beethoven and Schubert and felt that it was his mission to carry on from where they left off. Perhaps it is significant that he was so conscious of the high standards set by his predecessors that he destroyed many of his early string quartets. The first quintet in F major, Op. 88 was composed in Ischl near Salzburg, where Brahms spent ten of his summers. Despite being in the habit of disparaging his own compositions on many occasions, the quintet had him writing to his publisher Simrock ‘you have never before had such a beautiful work from me’ and to his friend Clara Schumann, he also sang its praises. In 1890 Joachim, the great violinist and dedicatee of Brahms’ violin Concerto, urged the composer to write a companion quintet to go with the F major. By this time, Brahms had been seriously contemplating ‘retiring’, feeling that his creativity was drying-up. To his friend Eusebius Mandyczewski, he expressed his concerns and disillusion: ‘I’ve been tormenting myself for a long time with all kinds of things … and nothing will come of it … it’s not going the way it used to. I’m just not going to do any more.’ Certainly, the completion of the G major Quintet, he regarded as his farewell to composition. Fortunately this was not to be and, over the next seven years before his death in 1897, he composed, amongst other things, the Clarinet trio and Quintet, the Opp. 116-119 piano pieces and the two Clarinet sonatas. Like the earlier work, the G major Quintet was also composed in Ischl and given its premiere by the Rose Quartet. Being on a larger scale with four movements (the F major has three), the work displays virtuosic string writing, outshining any of his other chamber works. Perhaps his confidence was buoyed up by the successful instrumental writing of the Double Concerto, composed three years before, in 1887. From the opening bars of Op. 88 the Uppsala Chamber Soloists show a great affinity for this music. The beautiful first subject is warm, tender and expressive. Tempi are well judged and phrasing and dynamics are such that the drama is allowed to unfold in a natural way. The second movement is unusual in that Brahms divides it into three contrasting sections. In the first section which is marked Grave, the Uppsala players capture the reflective, wistful quality of the melody. Their beauty of tone is second to none. The allegretto and presto sections are light and playful and provide an effective contrast. The finale is invigorating and ebullient.